Most of us think of Walt Disney as the creator of Mickey Mouse and Disneyland. But his impact on American culture went beyond cartoons and theme parks. Whether it was hit television programs such as "The Mickey Mouse Club" or the marketing of products, Disney changed our world. Yet little was known about Walt Disney, the man — until now. Neal Gabler has written what many are calling the definitive Disney biography in his new book, "Walt Disney: The Triumph of the American Imagination." On The Early Show Wednesday, Gabler offered insights into the childhood, early career and personal life of the man who created Mickey Mouse and changed the face of animation forever. Gabler told co-anchor Hannah Storm about Disney's very difficult childhood, and the failure of his first studio. He told viewers about Disney as a husband and family man, and as a businessman. Gabler addressed Disney's reputation as an anti-Semite, and he discussed how Disney reinvented recreation with Disneyland, though his true dream for Epcot was never realized. But Gabler told CBS News that Disney's "greatest legacy was his mindset that you could look at the world and impose your will on it. You could control a world that seemed so out of control. He seemed to make dreams come true. We feel the same affinity. If Walt can do it, we can do it. It's a powerful legacy." Gabler told Storm that it took him "seven long years to write the book. Storm noted the irony that a man known for understanding what kids love had a very difficult childhood himself. "I think there was a cause-and-effect relationship here between what he finally produced and the childhood that he had," Gabler observed. "He grew up under very arduous circumstances. His father owned a paper route, and Walt delivered the papers and, 40 years later, he still had nightmares — he would wake up in the middle of the night having nightmares about having to trudge through snowdrifts up to his neck or having to redeliver papers that somehow had been missed or hadn't been delivered. So this was a very difficult childhood — and, to top it off, all the money he earned was kept by his father, so he earned nothing from this." Asked if Disney chose animation as a path out of his harsh early reality, Gabler responded, "He was always interested in art. He was a very good artist when he was very young. But, again, I say, there was a cause-and-effect relationship here because the life was so difficult, the childhood was so difficult. There was no time to play. He would get up at 3:30 in the morning to collect the papers. "So, what Walt did is, he devised, in my estimation, an alternative reality, a better reality than the one in which he lived. And, in some respects, he spent his entire life trying to perfect that reality, and animation was one of the forms of doing that. Animation is really kind of the ultimate form of control. You take inanimate objects, and you bring them to life, and there's only one other figure aside from Walt Disney who really does that, and that's God. And Walt Disney, I'm sure, saw the affinity." Storm pointed to another irony: that a man adored by many as a benevolent, grandfatherly figure was also demonized for the type of boss he was and had a reputation as an anti-Semite. "That's one of the questions everybody asks me," Gabler said, " 'Was he an anti-Semite?' That's out there. My answer to that is, not in the conventional sense that we think of someone as being an anti-Semite. But he got the reputation because, in the 1940s, he got himself allied with a group called The Motion Picture Alliance for the Preservation of American Ideals, which was an anti-Communist and anti-Semitic organization. And though Walt himself, in my estimation, was not anti-Semitic, nevertheless, he willingly allied himself with people who were anti-Semitic, and that reputation stuck. He was never really able to expunge it throughout his life." As for the type of boss Disney was, Gabler said he was "Always a perfectionist. Obsessive about that. But, early on, there was a real sense of camaraderie, a sense of spirit, a sense of mission. 'We're gonna make the greatest animations ever.' That all emanated from Walt. As time went on, particularly after 1941, when the studio was struck by the Screen Cartoonists' Guild, Walt became much more tyrannical, much more difficult to work with. And Walt saw people in instrumental terms. Walt's idea was, 'Can you help me make these cartoons perfect? If you can do so, great. If you can't, you're what he called dead wood. Forget you.'" Disney was also different on the financial front than he's envisioned today. "You think of Walt Disney as being tremendously successful," Gabler remarked. "It was, ultimately. But "Snow White" was the only animation, of those great, golden animations, with the exception of "Dumbo," the only two that made money." Gabler also said the Epcot of today isn't what Disney envisioned. He said Disney would be "very disappointed. Walt's final vision in his life, which was Epcot, was a fully-operational city of 100,000 people, an experimental city that had parkland, the latest in technology, the latest in communication, transportation. It became a kind of glorified world's fair. But Walt had much larger ambitions for it. He was an urban planner at the end of his life." Go to Page 2 for many quick, interesting tidbits about Walt Disney. Of the classic animations of the 1930s and 1940s, only "Snow White" and "Dumbo" returned any profits on their initial release. The others — "Pinocchio," "Fantasia," and "Bambi" — all lost enormous sums of money and were deemed failures. From the early 1940s to 1955 when he opened Disneyland — Disney invented the theme park — he was in dire economic straits, always forced to tighten the studio's belt. Walt Disney can be credited for re-inventing animation by introducing much more sophisticated techniques, enforcing the concept of personality in cartoon characters and making the first feature-length animation (Snow White) . Disney was responsible for the creation of the first synergistic entertainment company. Disney was responsible for the first nature documentary and was one of the prime movers of the conservation movement, first through Bambi and then through the studio's "True-Life Adventures." Walt Disney was only 20 when he founded his first animation studio, which subsequently went bankrupt. He was 21 when he founded Disney Bros., which later grew into Walt Disney Productions. In 1928, Walt Disney lost all of his animators in a coup staged by his distributor, Charles Mintz. He was forced to restart his company again from scratch. Walt Disney claimed to have created Mickey Mouse while he was riding the train back from New York to Los Angeles after his showdown with Mintz. He chose a mouse because it was one of the few animals that had not yet been animated as a starring character. Mickey's original name, allegedly, was Mortimer. Walt's wife, Lillian, objected because she thought it too sissified. After 1924 Walt Disney never drew another animation, even though he was a skilled commercial artist. Many assumed he drew all the cartoons by himself. The number of children who enrolled in the Mickey Mouse Clubs, which the studio and exhibitors promoted them as an activity for children on Saturday mornings, was larger than the number of Boy Scouts and Girl Scouts combined. Walt himself provided the voice for Mickey Mouse until 1946. Walt was known at the studio for acting out the cartoon characters at story meetings and providing his animators with a guide. Among the names considered for the dwarfs in Snow White were: Deafy, Dirty, Awful, Blabby, Burpy, Gabby, Puffy, Stuffy, Nifty, Tubbyk, Biggo Ego, Flabby, Jaunty, Baldy, Lazy, Dizzy, Cranky and Chesty. Snow White took four full years and virtually all the resources of the studio to complete. It would have taken a single man or woman 200 years to have made the film. Walt had great foresight about television. He refused to sign a contract extension with his distributor, United Artists, in 1936 because UA would not grant Disney TV rights. Walt Disney suffered a nervous breakdown in 1931. He descended into depression after the war, concentrating his attention on model trains rather than on motion pictures; he had a large model train installed to run around his home in Brentwood. Walt Disney Productions was the first motion picture studio to sign an agreement with a television network (ABC) to provide programming. Walt concluded the agreement only because ABC provided financing for Disneyland in return for the show. The success of the "Davy Crockett" programs on the "Disneyland" TV show caught the studio completely off-guard. Crockett's death had already been filmed when the first program aired. "Davy Crockett" was so successful that it was watched on nearly half the television sets in America. Its star, Fess Parker, was greeted by crowds of 20,000 when he made a promotional tour. "Fantasia" was the result of a chance meeting between Walt Disney and conductor Leopold Stokowski at Chasen's restaurant. During World War II, the Disney studio became a war factory. Well over 90% of its production was done in the service of government training, education and propaganda films. Walt Disney dramatically increased the sale of color television sets when he moved from ABC to NBC for his series "Walt Disney's Wonderful World of Color," which was the very reason NBC lured him. The studio stopped production on "Pinocchio" for six months because Walt felt the title character wasn't likable enough. During this time he devised the idea of introducing Jiminy Cricket as Pinocchio's conscience. The "Man in Space" series on the "Disneyland" television program was instrumental in building a constituency for the American space program. President Eisenhower advised members of his administration to watch it. 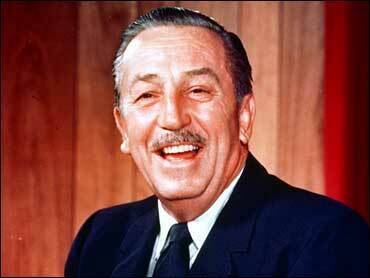 Walt Disney received 32 Academy Awards, more than any other individual. Walt Disney testified as a "friendly" witness before the House Committee on Un-American Activities in 1947. He mistakenly accused the League of Women Voters of being a communist organization, for which he later had to recant. When the studio made its first public stock offering in 1940, the underwriter insisted the company take out a large life insurance policy on Walt, payable to the stockholders, because Walt was regarded as indispensable to the studio's success. Walt Disney founded the California Institute for the Arts, intended as a school to train artists for motion pictures. Walt Disney's original concept for Epcot was as a fully-functioning modern city in which the workers for Walt Disney World, as many as 100,000 of them, would live and test new concepts in urban design. Walt modeled Mickey Mouse on Charlie Chaplin, who actually assisted the Disneys with financial advice in helping them determine what kind of proceeds they should be getting from their distributor on Snow White. Shortly before his death, Walt met with executives at General Electric with the idea of selling the studio to that company. Even though Walt Disney's alleged signature remains the company's logo, his real signature was in fact much more flamboyant and artistic than the familiar one. Walt was once asked by several movers and shakers to run for mayor of Los Angeles. He declined. Russian premier Nikita Khrushchev was livid when he was denied a request to visit Disneyland during an American visit. Once the studio was in financial straits, Walt had everything focus-grouped, including the storyboards for prospective animations. MGM head Louis B. Mayer once rejected the opportunity to distribute Mickey Mouse cartoons shortly after Walt had invented the character because Mayer said that pregnant women would be frightened by a giant mouse on screen. Despite his status in Hollywood, Walt seldom socialized and spent nearly all his time outside the studio with his family. Contrary to rumors, he is not frozen. In fact his body was cremated, and his ashes are interred at the Forest Lawn Cemetery in Glendale, Calif., near his studio.